From Streets Of India: Paneer Tikke Ki Chaat - Simply Fahad-istic! The concept of gourmet cuisine has expanded the boundaries of street food culture,and hence newer preparations such as this Paneer Tikke Ki Chaat. There is no extraordinary effort that goes into the making of this mouth-watering dish,yet there is nothing ordinary about the taste it provides.Simply speaking,it is hot mouthfuls of yogurt and spice rubbed,grilled cottage cheese dices combined with the freshness of ginger,coriander and lemon juice.The chaat masala gives it an interesting kick. If you love the usual tandoori paneer tikka served at restaurants,this recipe takes it to a different level altogether! 3/4 cup curd(plain yogurt) - The thicker,the better.If not thick enough,put it in a sieve/cloth for half an hour to drain the whey. Marinade the paneer with the juice of a lemon,red chili powder and some salt for twenty minutes.The lemon juice,being acidic,will tenderize the paneer,making it amazingly soft and lovely. Once done,drain the marinade and in a separate bowl,whisk the plain yogurt,add in it the ginger-garlic paste,garam masala powder and salt.If you are not using any green chilies for your chaat,you may like to add some red chili powder at this stage.Add in the paneer,mix lightly,but well and keep it in the refrigerator till serving time.Refrigeration will dehydrate the marinade,making it coat the paneer pieces well. At the time of serving,rub oil generously over the grill of the oven,and pre-heat it to 180 degrees C/350 degrees F.Place the marinated paneer pieces on the greased grill,and grill for 15 minutes,till the marinade becomes dry.Then,baste(The process of brushing a food product with a liquid,while roasting,so that it retains its moistness is called basting.) the paneer with the leftover marinade,and grill it further for 5 more minutes. 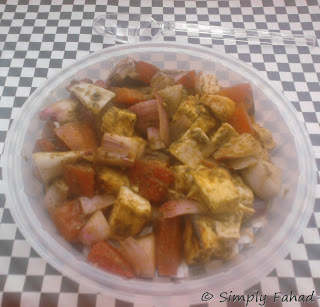 Remove the paneer from the oven,and carefully cut it into smaller dices.Toss these paneer dices in a bowl with the remaining ingredients - tomato,onion,ginger,green coriander,chaat masala,black salt,green chilies and salt.Serve immediately. 1. If you don't have an oven,paneer can be grilled on a bar-be-cue grill or in an electric tandoor. 2. Two tablespoons of hari chutney can be added to the dish,at the finishing stage,for yet another interesting flavor. This looks JUST amazing and JUST the sort of food I adore!